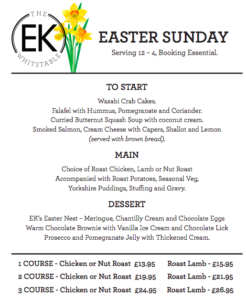 We are now taking bookings for our special Sunday Easter lunch. We will be serving between 12-4pm, book on 01227 770773 to reserve your table. If you have any questions please do not hesitate to contact our friendly team. 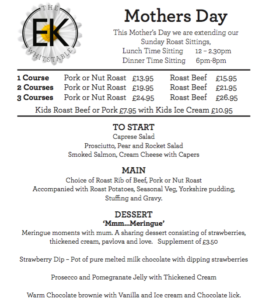 Book now for Mothers day 31st March! With our special Sunday Lunch Menu, it will be an experience to treasure. Each mother will receive a complimentary prosecco and flower on arrival. If you have any questions please do not hesitate to contact our friendly team. After returning from Australia Natalie and husband, Andrew Hennessy worked hard to transform the East Kent into a modern Gastropub. We would love you to come on a culinary experience with us, one with an Australian Twist! With a seasonal menu, a vibrant atmosphere and good beer, we will not disappoint.